Released in March 2012, prolific author Lorna Schultz Nicholson has expanded into the realm of Young Adult novels. Nicholson is well established in the middle grade fiction category as well as hockey non-fiction for various audiences. 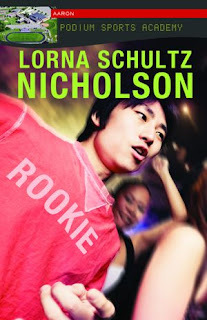 Nicholson's foray into the YA shelves of your favorite bookstore includes the hockey themed book Rookie . Fresh off the plane from Vancouver, sixteen-year-old hockey player Aaron Wong is excited to be starting his first year at Podium. Aaron has to make friends and fit into a new high school, while adjusting to a new home and a family. Things seem to be going well for the rookie, but the hockey team captain has it in for him. Aaron’s world is turned upside down when the captain makes him the target of a brutal hazing at the team’s first party. To turn his year around, Aaron has to overcome his embarrassment and confide in friends and coaching staff. The 144 page book is an easy read. It would be a perfect choice for the young reader in your life, especially if he or she is a reluctant reader to begin with. Also released earlier this year by Nicholson and Lorimer books is a title called Vegas Tryout . It is about a Toronto girl who goes to Las Vegas in pursuit of her synchronized swimming dream.